Photos of Palmetto House, an historic property situated on the North Shore Road in Devonshire. The property is owned by the Bermuda National Trust and recently underwent a renovation. It is on the market to be rented and is open to the public in the interim. 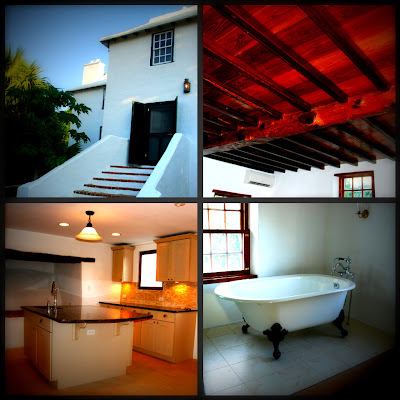 The house is approximately 300 years and is a good example of Bermudian architecture. During World War II, it served as a clubhouse for British troops stationed at nearby Fort Prospect. The house was built by Captain William Williams who settled in Bermuda in 1634 and was acquired from the family by the British Army in 1868 when it took over most of this Devonshire Parish. Its architecture has the cruciform structure and grand "welcoming arms" staircase. There is a separate, refurbished studio apartment outside which was probably the kitchen. Between the main house and the studio, there is a courtyard patio. The water tank is above ground. I may post more photos later. I literally squealed when I saw the claw-footed tub AND the rain-head shower. First claw-foot I have seen in Bermuda. The renovation was generally done well, though they have mixed high- and lower-end materials. The master bathroom is a good example of that. Overall great effort and sympathetically done.